Bubble London bursting with talent in 2015! We’re bursting with giddy excitement after treating ourselves to a spectacular showcase of talent for all things kids. What is this showcase, you ask? It’s Bubble London and just for something different, we’ve chosen ten brands that made their debut on this year’s Bubble London stage. Click on through to find out which they are! 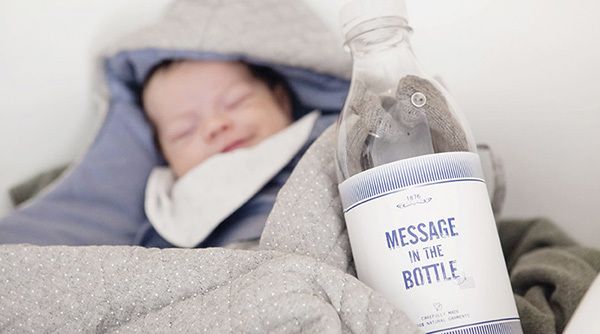 Message In The Bottle should come with a warning. A warning for your aching heart and thundering ovaries. So cute is the packaging and the contents, absolutely divine (pictured above and top). 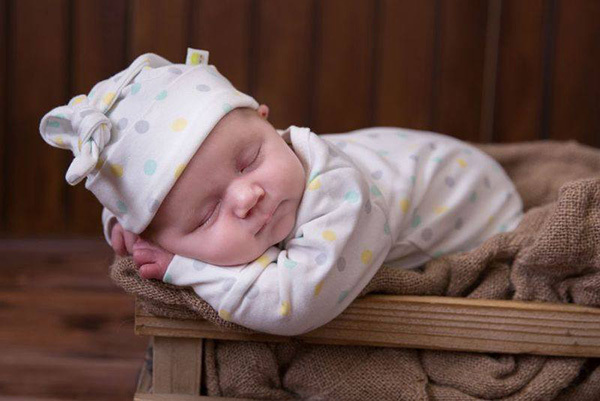 Choose from basic wraps and bibs to sumptuous knits – you guessed it, they make a perfect new baby gift. We had a couple of Aussies stepping up to the Bubble London plate this July, including Tom & Teddy. 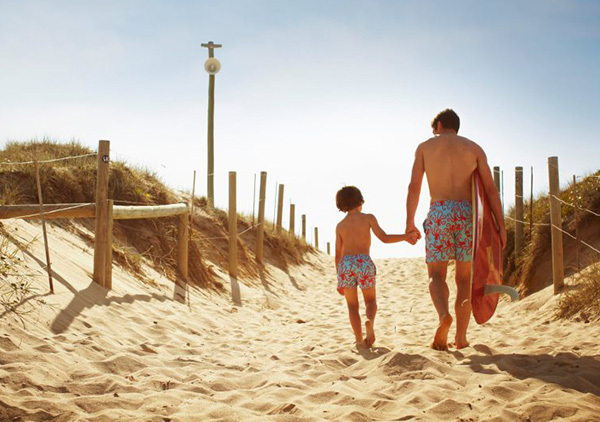 I love that this brand is so quintessentially Australian – matching swimwear for boys and men. Their collection is brimming with board shorts and rash tees in vivid prints, perfect for celebrating our Australian summers. Our second Australian exhibitor is the gorgeous Tinker & Boo. 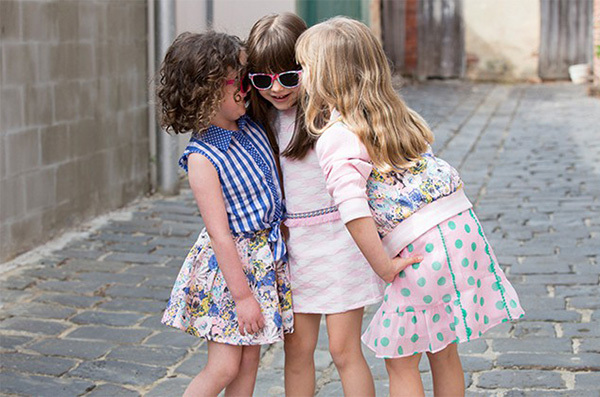 It’s here in this online fashion store you’ll find a treasure trove of girls’ party dresses for all occasions, plus a fab selection of everyday wear in all manner of prints and patterns! A stellar line up of handmade boutique styles, luxe leather shoes for children can be seen at Eli 1957 from buttery soft ballet slippers and Mary-Janes to summer sandals and deck shoes, this Spanish brand has them all. 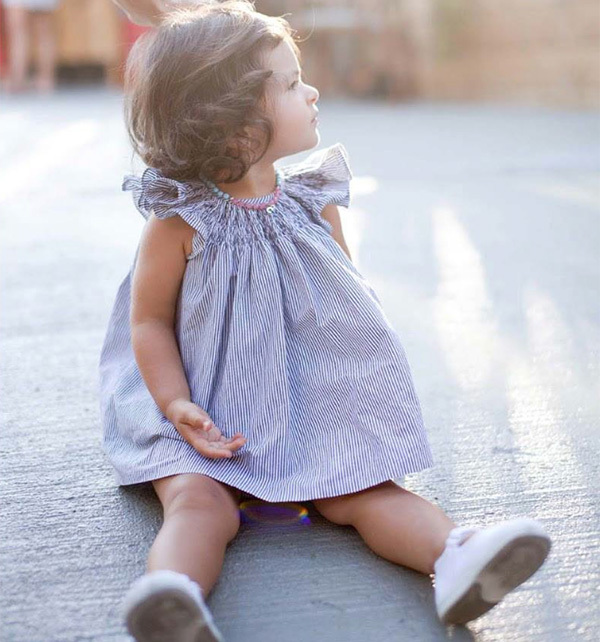 It’s all in the details when it comes to children’s clothes, and for those who love a ruffle, a lace edged sleeve or a crisp collar, Benedita has it all. Including a line-up of rather delicious swoon worthy rompers for when the weather warms up. 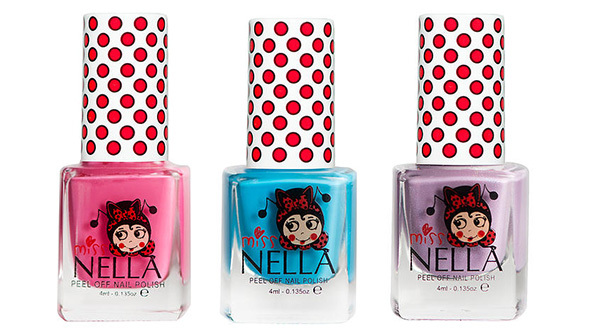 A mini manicure for a little miss just got a lot easier with the arrival of French brand, Miss Nella. A collection of nail polishes which have a water-based formula, free of toxins, odourless and can even peel off when kids tire of the colour. Perfect for providing the finishing touch to girls playing dress up or copying mum. A wetsuit with a difference? You bet! 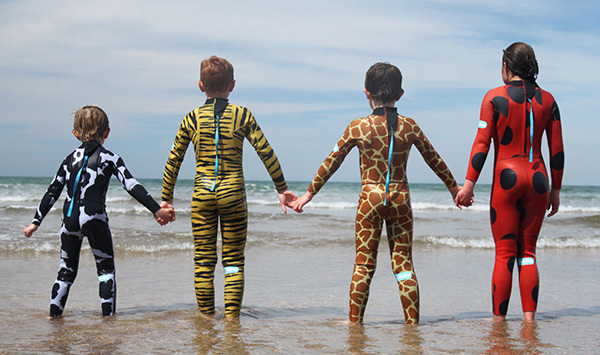 Potwells is home to the most extraordinary animal print Saltskin kids wetsuits. Choose from short and long sleeved and leg varieties in prints that include cows, giraffes – even a ladybug! Baby Acorn is responsible for the cutest little newborn cotton gift sets. 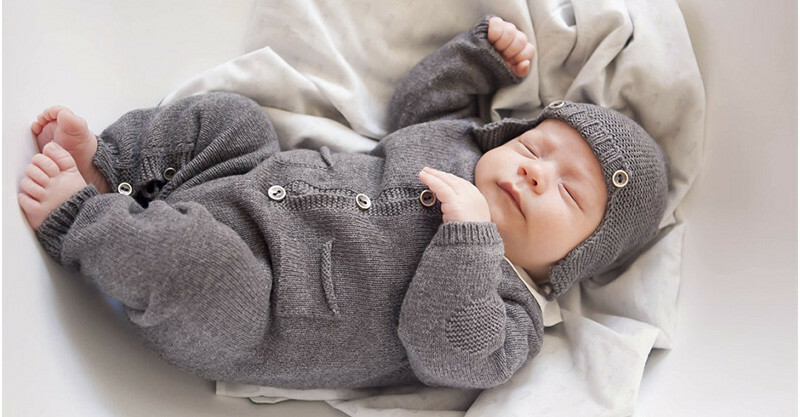 Their unisex woodland themed layette pieces are sold individually so you can mix and match items as you please which is super handy. I notice within the Bubble London newcomers there’s a definite nod to classic children’s dressing – lots of tailored shorts, overalls, frilled sleeves, crisp cottons and linen. Perhaps it’s the influence of what we see Britain’s most photographed tot, Prince George, dressed in or maybe just a happy coincidence. 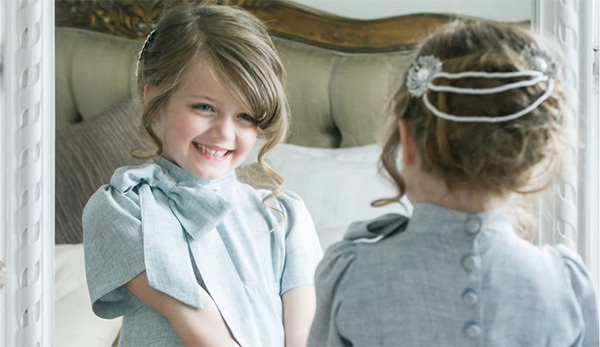 Nevertheless, if it’s luxurious clothing fit for a young prince or princess you’d love to see your own cherubs in, you can find it at Little Wardrobe London. 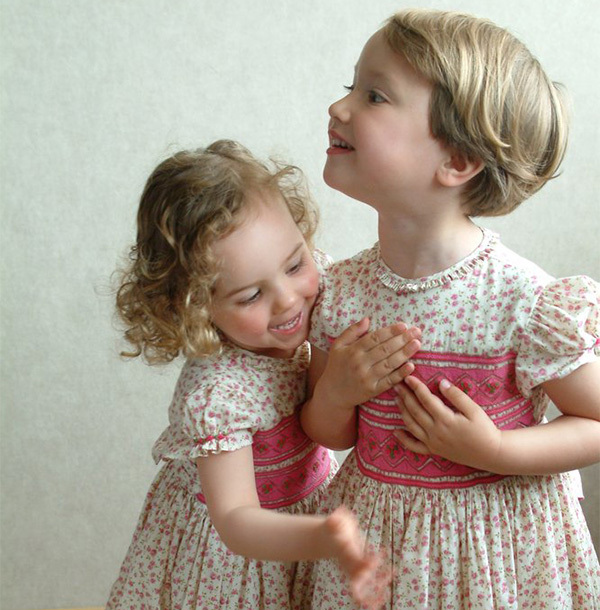 I won’t lie, I did let out a small squeal of delight when I clapped my eyes on these gorgeous smocked dresses from L’île aux Fées. The art of smocking was a big thing when I was a young girl and I’m ever so pleased to see it’s still trending in Europe now – and I bet my grandmother would be too! That’s it for Bubble London in 2015 folks, next show won’t be until January 2016!